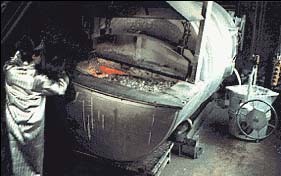 Tapping Molten Aluminum Casting from a tilting barrel furnace. Courtesy of Can Eng Manufacturing, Ltd.
Foundries produce complex metal shapes by melting aluminum or aluminum alloys and pouring the molten metal into a mold to solidify into the desired shape. Aluminum casting accounts for 32% of all metal castings in the United States and the majority of these castings are for the automotive industry. There are three main methods used for casting metals: sand casting, investment casting, permanent mold casting, and die casting. Die casting and permanent mold casting together account for over 80% of all aluminum casting. Due to aluminum’s low melting temperature, inexpensive steel and iron can be used for forming the dies and molds. The molten aluminum feeding the casting line is derived from three different sources: ingots from a primary aluminum producer, molten aluminum directing from a smelting plant, or partially processed recycled aluminum scrap. Casting consists of pouring molten aluminum into molds. Once in the mold, the aluminum solidifies into the shape defined by the mold. Three different casting methods are used: sand casting, permanent mold casting, and die casting. Molten aluminum is derived from three different sources: ingots from a primary aluminum producer, molten aluminum directly from a smelting plant, or partially processed recycled aluminum scrap. Sand Casting is the most versatile method and the most economical for producing small quantities. Almost any shape mold can be produced from fine sand and binder mixture. After casting, the sand molds must either be hauled to land-fills or reconditioned. Thermal sand reclamation processes are available that remove the binder material from the sand and allow the sand to be reused. These processes are typically natural gas fired. Investment casting uses a ceramic mold which was created around a plastic or wax replica of the desired metal shape. Prior to casting, the ceramic mold is fired which increases the mold strength and burns the plastic or wax replica, removing it from the mold. Investment casting is capable of creating higher precision casts than sand casting. Permanent mold casting uses steel or other metal molds to shape the molten aluminum. Molten aluminum is forced into the mold under gravity or with the aid of a vacuum. Permanent mold castings are stronger than sand castings and less expensive for large production quantities. Die Casting is used for producing accurate components which require little subsequent matching. The molten aluminum is forced under high pressure into steel molds or dies which shape and cool the molten aluminum.